Brain tumors are the not same as those found in other parts of the body. A tumor can be benign or malignant. A benign tumor is not cancer. It will not spread to other parts of the body. But, it can still grow and put pressure on the brain. This pressure may damage healthy tissue and cause problems with how the brain works. Depending on where it is, pressure can cause problems with breathing, heart rate, or cause death. Malignant tumors grow in an irregular way. They invade tissue around them. Brain tumors rarely spread to other parts of the body. But, they can spread throughout the brain. Damage caused by malignant tumors can also cause disability and death. The brain and spinal cord make up the central nervous system (CNS). The CNS controls how the body works. It reads information from the senses. It also controls body temperature, sleep patterns, and movement. The brain is also the center for memory, learning, and emotions. Cerebrum —Thought, reason, and speech are found here. It processes sensory information from the body. It’s also where your emotions come from. It has 2 large hemispheres. Cerebellum —Found at the back of the head near the base. The cerebellum coordinates movement and balance. Brain stem —The back and bottom portion of the brain that connects to the spinal cord at the base of the neck. Nerves transmit messages back and forth to the brain. There are 3 parts—the pons, medulla oblongata, and midbrain. These structures control breathing, digestion, and heart function. Neuron —A nerve cell. Linked neurons make up the nerves and brain tissue. Meninges —Three layers of tissue that surround and protect the brain and spinal cord. They lie inside the skull and spine. Skull —The bony shell that surrounds and protects the brain. Cerebrospinal fluid (CSF)—Clear, circulating fluid that surrounds, protects, and cushions the brain and spinal cord. CSF can be found inside the meninges. Blood-brain barrier (BBB)—A barrier that prevents certain substances in the blood from reaching the brain. The BBB can keep out infections or toxins. But, it can also block medicines that may be helpful in treating brain conditions. Cell division and cell death are normal. It’s meant to replace old or damaged cells. Sometimes this can continue after it's supposed to stop. This extra growth forms a tumor. It’s not clear exactly what causes these problems. It’s likely a mix of genes and the environment. Primary brain tumors start in the brain or in the layers that surround it. It's the second most common type of cancer in children and adolescents. 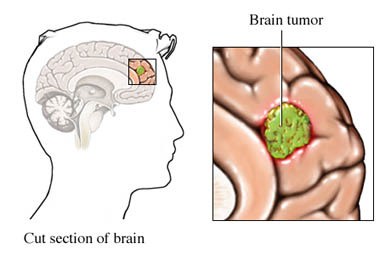 Secondary brain tumors come from cancer in other parts of the body. 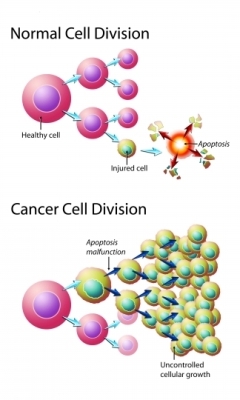 Cancer cells break away from the original site. They travel to the brain in the bloodstream. They're known as metastatic tumors. Secondary tumors are always malignant. Meningiomas —Tumors start in the layers that surround the brain and spinal cord. Gliomas —The glial cells support and protect neurons. There are 3 types called astrocytes, oligodendrocytes, or ependymal cells. Astrocytoma is a common type of glioma in adults and children. Pituitary adenomas —The pituitary gland releases hormones. It's found at the base of the brain. Tumors start in the pituitary cells. Nerve sheath tumors —Neurons are covered in a myelin sheath. It helps speeds messages back and forth to the brain. Nerve sheath tumors may cause loss of the protective sheath. This can lead to problems with how the neurons work. Medulloblastomas —Tumors that start and grow in the cerebellum. It's the most common type of brain tumor in children. What are the risk factors for brain tumor?What are the symptoms of brain tumor?How is brain tumor diagnosed?What are the treatments for brain tumor?Are there screening tests for brain tumor?Can brain tumor be prevented?What questions should I ask my doctor?What is it like to live with brain tumor?Where can I get more information about brain tumor? Astrocytoma and oligodentroglioma in adults. EBSCO DynaMed Plus website. Available at: http://www.dynamed.com/topics/dmp~AN~T116413/Astrocytoma-and-oligodendroglioma-in-adults . Updated May 13, 2016. Accessed August 8, 2018. Brain and spinal cord tumors in adults. American Cancer Society website. Available at: https://www.cancer.org/cancer/brain-spinal-cord-tumors-adults.html. Accessed August 8, 2018. Brain and spinal cord tumors in children. American Cancer Society website. Available at: https://www.cancer.org/cancer/brain-spinal-cord-tumors-children.html. Accessed August 8, 2018. General information about childhood brain and spinal cord tumors. National Cancer Institute website. Available at: https://www.cancer.gov/types/brain/patient/child-brain-treatment-pdq. Updated July 5, 2018. Accessed August 8, 2018. Overview of brain tumors in children. Merck Manual Professional Version website. Available at: https://www.merckmanuals.com/professional/pediatrics/pediatric-cancers/overview-of-brain-tumors-in-children. Updated August 2015. Accessed August 8, 2018.